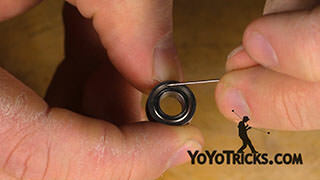 Learn to clean a yoyo bearing using lighter fluid and the paper cleaning method. How to Clean a Yoyo Bearing – Paper Cleaning Method Yoyo TrickIn this video we’re going to talk about how to clean your bearings. 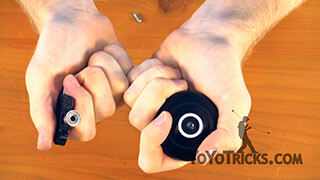 Now, if you keep your bearings properly lubed, like how we show you in our thin yoyo lube video, then cleaning your bearings in something you’ll have to do only very irregularly. In fact, the entire yoyotricks.com team only has to clean their bearings less than once a year on average because we keep our bearings properly lubed. But, sometimes, if you drop your bearing in the dirt, or you’ve been walking the dog in a sandbox, or you use lube not made specifically for yoyos, or just bad lube, you’re going to have to clean your bearings to get it back up to speed. To clean your bearings, you’re going to need a pin, or a needle, or a safety pin, or something like that, the bearing that you want to clean, a pencil or similar utensil, some paper towel, a small glass jar or bowl, and a solvent. In this video we’re using lighter fluid because it’s cheap, it comes in a small container, and it’s not very harmful. Around your house you might have some chemicals like acetone, or mineral spirits, or paint thinner, and these defiantly work as solvents, but remember that they are harsh chemicals, and that you should only use them in a well ventilated environment. So the first thing that you want to do is remove the shields off your bearing, as this helps get the good stuff in and the bad stuff out. So, yo remove the shields, you’re going to need your pin and your bearing. You want to look around the inner edge of the outer race of the bearing until you find this little gap. And that there is the hole in the C clip where you remove it. You want to take your pin and lay it flat next to the bearing, you don’t want to have it pointing down, that’s not going to get you anywhere. You want to put the needle into that gap and press it the corner between the outer race and the C clip. When you’re applying pressure, you want to pluck the c clip down to the center of the bearing, and it will release. So you see the C clip popped out right there. Some bearings are harder to remove the C clip than others, but if you give it a good try you’ll get it eventually. Then you just want to turn the bearing over, bang it out on the table a couple of times, and the bearing shield is going to fall right out. After you’ve de-shielded your bearing, the next step is to take your bearing and put it in the glass jar, and then fill the glass jar with lighter fluid until the bearing is completely submerged. Once you’ve done that, all you need to do if give the jar a little shake, and then let it sit for about five to fifteen minutes. Alright, we’re back through the magic of editing and the bearing has been sitting in the solvent long enough to dissolve everything in there. Take your pencil, and take the bearing out of the light fluid, put it on the paper towel, and let it sit for about ten minutes to dry. You really want to make sure it’s fully dry because some solvents can damage plastic. If you want to speed this process up a little bit, you can take the corner of the paper towel and work it in the bearing, and that’ll absorb the solvent out of the bearing. Once the bearing is fully dry, you want to take it and put it on the end of the pencil and give it a nice flick. 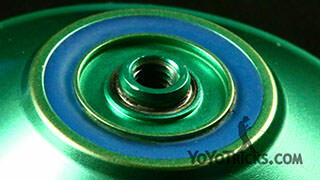 If your bearing is spinning smoothly, then great job, you just cleaned your first bearing. But, if it’s still a little gritty, you might want to try cleaning it again, sometimes the second time is the charm, and if that still doesn’t work, we’re going to have to resort to something a little more drastic. I’m introducing you to the paper cleaning method. To do this, you need a pair of scissors, a piece of white printer paper or note pad paper, a pencil, and your bearing, which has to be unshielded to do this. So, what you want to do, is take your piece of paper and your scissors and cut off the corner of the piece of paper and make a triangle. This triangle is about an inch and a half long and three quarters of an inch wide. Then, you want to take this piece of paper and fold it in half, so that you have one triangle that is two piece of paper thick. See that? Then, you take your bearing on the end of the pencil and take the thin end of the paper and thread it between the balls, touching the outer race, you want to just slide it right through there. So you see how the paper is poking through now? Then, you’re going to take this thin end, and give it a little tug until the paper wont slide anymore, you want to be careful not to break the piece of paper, as you can get small particles of paper in the bearing, and you’re going to have to clean it all over again, and that’s no fun. And, if you pull too hard, sometimes you can break the bearing, so you really need to be careful. So, once the bearing is all snug, you’re going to pinch the outer race of the bearing, and simply rotate the pencil maybe ten or twenty times, and once you do that, take the piece of paper out, and you’re going to notice that there is some black gunk on the paper, and that is what has been keeping your bearing from playing well. So, once you take the paper out and you see that black gunk, you’re simply going to cut another triangle, fold it in half again, put it in the bearing, rotate it, and take it out, and you’re going to keep repeating that process until there is no more gunk left in the bearing. After you do that, your bearing should be spinning pretty well. But, sometimes, it doesn’t quite work out, and when that happens, your bearing is probably dead, and it’s time to replace it. But, if it does work, all you need is some yoyotricks.com thin lube, lube up your bearing, put it back in your yoyo, and play with it. That is how you clean your bearing.